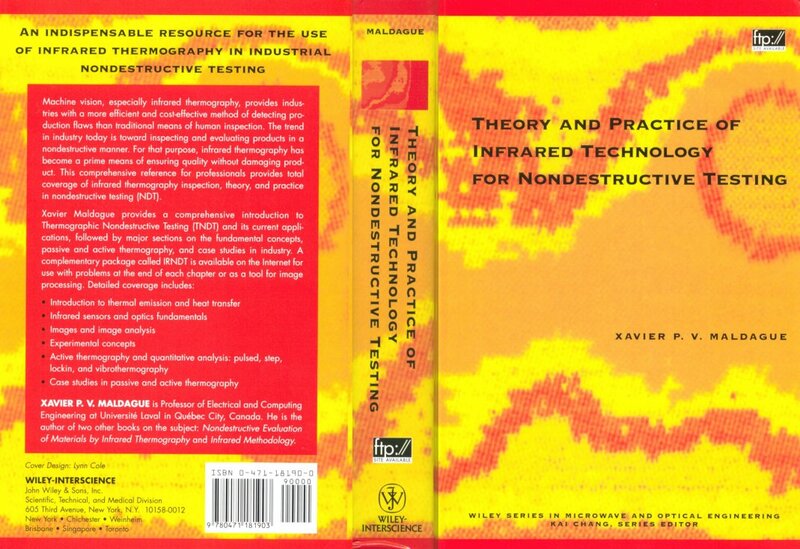 Infrared Technology for Nondestructive Testing is the single source of information about infrared thermography for nondestructive testing, includes material testing and imaging-based inspection. The book includes fundamental concepts of theory, instrumentation, and experimental practice as well as practical applications. It brings together fundamental con cepts and practical aspects in one single source. In Part I, the fundamental concepts are presented This part is organized in seven chapters and covers: thermal emission, introduction to heat transfer, thermal sensors, infrared imaging devices, image analysis, materials and experimental con cepts. These chapters presents the foundation of the infrared technology field. While the treatment of the various topics is complete by themselves, references are provided for those who want to probe further. As a general rule, only college phys ics, mathematics and general instrumentation knowledge is necessary. Part II concerns active and passive thermography. Generally, in active thermography external stimulation is required to generate relevant thermal contrasts in thermal steady state `specimens', while in passive thermography, the actual ther mal state of the `specimen' provides enough information to characterize the sought features. Thus, the active thermogra phy presentation elaborates on the various stimulation schemes such as pulse, step, and modulated, while special attention is paid to data analysis, since active thermography is often deployed for quantitative characterization. In Part III, case studies are presented for both active and passive thermography, including external and internal stimula tion, preventative maintenance for electrical utilities, passive thermography for the construction industry and evaluation of material thermal diffusivity. This allows a summary of the material previously discussed in the representative applica tions. Also included is a series of Matlab(1) routines which allows to put concepts discussed in the book into practice; this package is called IRTNDT. The problems at the end of each chapter make extensive use of IRTNDT capabilities. Moreover, IRTNDT can serve as a stand-alone tool, since various image formats are accepted for processing using the methods discussed in the book, such as blob detection, thermal modelling, thermal contrast computations, etc. All chapters end with problems. Materials draws on case studies to illustrate major points. Click on the icon to get the free: Acrobad (: program necessary to read files of format .pdf). Notice: these files are protected by appropriate copyrights, are to be used only in conjunction with the aforementioned book and are for private use only. Notice: these files are protected by appropriate copyrights, are to be used only in conjunction with the aforementioned book and are for private use only. No warranty of conformity is provided. Use at your own risk. (1) Matlab is a trademark of The Math Works Inc.
Last up date of this document: March. 16th, 2002 (date of creation: April 9th, 1996).